How Could I Get a Refund or Discharge from National Collegiate Student Loan Trusts? I’ve got really, really good news for anyone who has a Private student loan backed by National College Student Loan Trusts. $5 billion in debt may just end up getting forgiven thanks to the greatest clerical error in history. And you should pay close attention to this story, because it’s not just one of the biggest changes to private student loan debt forgiveness that I’ve covered in 10 years of tracking the industry, but one that may have a bigger impact on your loans than any other, ever. 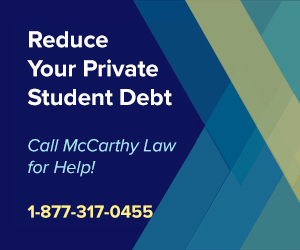 As reported by the New York Times, tens of thousands of private student loan holders may be eligible for having “their debts wiped away because critical paperwork is missing”, and that’s great news for anyone with outstanding private student loans. 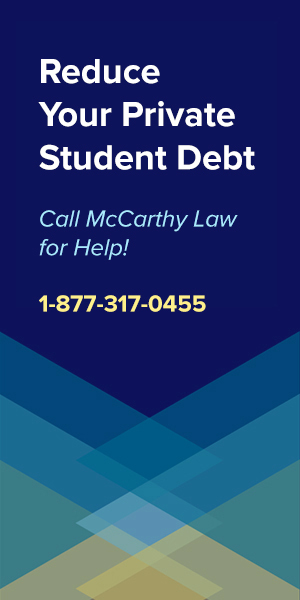 This potential private debt forgiveness opportunity stems from a court case where “troubled borrowers” who fell behind on their payments were being aggressively pursued by debt collection agencies representing the National Collegiate Student Loan Trusts, and the reason that these borrowers loans may end up getting discharged is that the “documents proving who owns the loans are missing”. In simple terms, the lenders represented by the National Collegiate Student Loan Trusts couldn’t even prove that the borrowers actually owed them any money, even though they were suing them in court! And the best news about this case is that it’s not limited to private loans held by the National Collegiate Student Loan Trusts, because this same problem has been found to be rampant across the industry with other lenders as well. In fact, while researching this story, the NY Times conducted a review of court records for hundreds of different lawsuits against private student loan borrowers and found that “many other collection cases are deeply flawed, with incomplete ownership records and mass-produced documentation”. Which means that all across America, private student loan lenders and debt collectors simply cannot prove who owns the loans they’re trying to collect, meaning that you may be able to get out of paying your loans back if you can prove that there’s no legal reason for you to do so! Bottom line: this story is the biggest potential private student loan loophole in history, and you’d be a fool not to at least investigate this incredible opportunity. Anyone who has a loan related to the National Collegiate Student Loan Trusts needs to pay close attention to this potential judgment document, which was just released, and which highlights the anticipated settlement terms between the NCSLT and CFPB, as it stipulates exactly what will happen if the settlement goes through. I think this is a huge deal, because it’s definitely possible that the National Collegiate Student Loan Trust won’t be able to find any of this paperwork, which would mean that anyone who’s been legally pursued by them, and been taken to court, had wages garnished, etc., is going to get the money back they had to pay on those loans. And it also means that if you’re one of the lucky people whom they cannot prove they legally own your loan, then you’ll receive immediate and complete forgiveness of the debt, and won’t owe them another single cent. 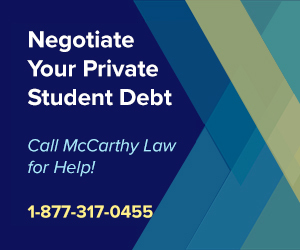 Can I Pursue a Private Student Loan Discharge? The great thing about the National Collegiate case is that it’s opening up doors for all private student loan borrowers, including people with loans from lenders totally unrelated to the case. How? Because this case is setting a precedent for borrowers everywhere to pursue having their own private student loans discharged by challenging the legal validity of the loans, since other lenders have the same problems as the lenders represented by the National Collegiate Trust. I would advise all of my readers with private student loan debt to immediately consider pursuing this opportunity, because even though it requires some investment, the potential for having your private loans discharged entirely seems completely worth the risk (especially if you owe a lot of money!). Maybe I’m old-fashioned, but I think that if you owe tens of thousands of dollars in student loans, then it’s worth paying someone a few hundred dollars to see if they can get you a discharge by forcing your lender to provide the paperwork that proves they actually own your loan, and that you’re actually legally required to pay it back. Again, this won’t work for everyone, but considering the rampant documentation problems uncovered by the New York Times, it may be worth spending a few hundred dollars to see if you can get tens of thousands of dollars in private student loan debt discharged completely. But you will need to choose carefully, because only a few companies are actually good at handling this process. My favorite company for challenging the legal validity of private student loans is definitely the Private Student Loan Relief Helpline, which is a paid service that specializes in these types of legal challenges, and focuses specifically on private student loans. These guys are absolute experts, and the way their process works is that you contact them, tell them about your specific financial situation, then find out if they think they’ve got a shot at getting your loans reduced, or discharged entirely. If there’s a chance at making it work, you’ll have to pay them several hundred dollars for their assistance, but they’ll immediately being challenging your lender to provide a paper trail proving beyond a reasonable doubt that you actually do need to pay the loans back. 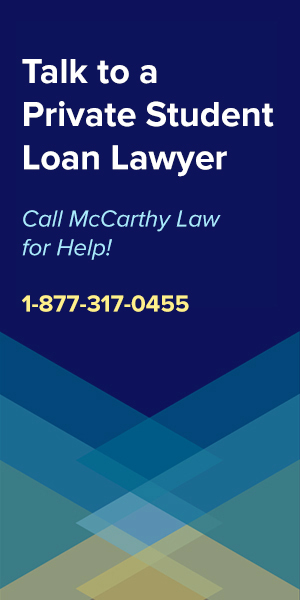 And the best thing about attacking the legal validity of your loans is that it terrifies your lender, especially since this National Collegiate case is blowing up in the Trust’s face, making it far more likely that your lender will be willing to work with you. 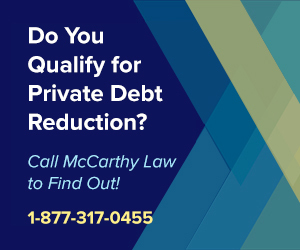 In fact, even if you don’t qualify for a complete debt discharge, your lender may be willing to start talking about debt reduction, some kind of low-cost settlement, or negotiations for better repayment terms (a longer repayment period, lower interest rate, etc.) or perhaps partial debt forgiveness. 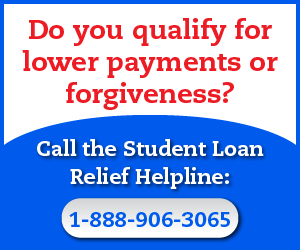 There’s truly never been a better time to go after your private student loans by challenging your lender directly, so if you’ve got some cash on hand, I would advise contacting the Private Student Loan Relief Helpline by calling them at 1-866-530-9946 to see if they can help. I want to point out that I’m not picking on the National Collegiate Student Loan Trusts for no reason; as in my opinion, they totally deserve the treatment they’re receiving from courts across the country. Why? Because the National Collegiate Student Loan Trusts didn’t even originate any of the loans that they’re being forced to forgive, as those loans were originally made by large banks, then sold to investors, who then paid this group to try and recover the outstanding debt. These guys are like hired guns, mercenaries, brought in to do the investors’s dirty work, by attacking ordinary Americans and threatening them with massive lawsuits, fines, fees, and other things that allow them to squeeze every penny out of the little guy, and hand it over to the the big corporation. You should be thinking of these “investors” who bought up private students loans as nothing more than Wall Street gamblers and Hedge Fund millionaires – the very same people responsible for completely taking our economy in mortgage crisis of 2008. In fact, this appears to be a similar thing to what happened nearly 10 years ago now, as it was big investment firms who had bought bad loans that lead to the economic destruction created when the investments went belly up. And the National Collegiate Student Loan Trusts won’t experience too much trouble from taking a financial hit either, because they’re a huge organization representing 15 trusts that hold 800,000 private student loans, comprising $12 Billion in total debt. Simply put, they’re HUGE! And this huge organization didn’t provide any actual service or value to borrowers; all they’ve done is bought outstanding debt from other people that actually issued the loans, and then been mean about trying to collect every little penny of that debt (even though they probably purchased it at a discount!). My opinion? Good riddance to the National Collegiate Student Loan Trusts, and the investors they represent. These greedy Wall Street gamblers deserve what’s coming, and I hope this thing continues to unravel at their expense. 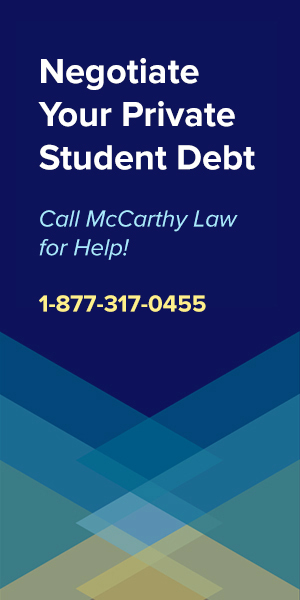 Simply put, The National Collegiate Student Loan Trusts have one of the most aggressive debt collection processes in the entire private student loans industry, and are well-known for literally suing their borrowers as soon as they fall behind on monthly payments. In fact, on average, the National Collegiate Student Loan Trusts have launched at least four new collection cases every day over the past year, with over 800 new cases alone being initiated in 2017 alone, and tens of thousands of lawsuits having been started since 2012. And these lawsuits don’t simply target big-wigs with massive student loan debt. In some cases, they’re going after tiny amounts of money owed by individual people who can hardly even afford to pay for basic necessities like food and shelter. In one case, the National Collegiate Student Loan Trusts even attempted to sue Jason Mason, who only had $11,000 in debt! Can you imagine a court case in which a $12 billion dollar mega-corporation is suing an individual person over $11,000 in debt? It’s completely ridiculous! Fortunately, the National Collegiate Trusts couldn’t even prove that they owned Jason Mason’s debt, since they’ve lost the paperwork that explicitly stated that, leading to their lawsuit getting thrown out of court, and Mr. Mason’s debt being entirely discharged. And I’m sorry, but I don’t feel bad for these Wall Street millionaires who are having trouble collecting money from ordinary Americans with private student loans, many of whom were defrauded by unethical For-Profit Colleges like Corinthian Colleges, ITT Tech, or DeVry, all of which are having to issue their own massive Private Student Loan Forgiveness Programs thanks to lawsuits initiated against them by the Federal Government, FTC, and Consumer Financial Protection Bureau. I think we’re fortunate that the National Collegiate Student Loan Trust is getting what they deserve, because they’ve been operating in the worst possible way over the past 5 years, kicking small borrowers while they’re down, piling legal bills on top of already inescapable student loan debt, instead of working with the borrowers who make an honest effort to settle up with them. I’m hoping that this case sets a strong enough precedent that the millions of ordinary Americans currently buried in excessive private student loan debt can use it to help fight their own lenders and get out of paying back the ridiculous amounts of money that they supposedly “owe” (but might not, thanks to this case…). Private student loans have been the dirty little secret kept from the American people for years now, with millions of Americans being completely buried in inescapable, ridiculous levels of debt, basically ruining their lives entirely. And while the National Collegiate Student Loan Trust has been annihilating individual borrowers in courts for years, the tide is finally turning, because recent lawsuits in New Hampshire, Ohio and even Texas have all been thrown out of court, ruling that the Trust has no right to try to collect debt that it can’t even prove it owns in the first place. Which means there’s finally a chink in the armor of the private student loan lenders, because borrowers now have a shot at at getting out of debt without being forced to face the long odds of qualifying for a Private Student Loan Bankruptcy Discharge. But that’s not all, because borrowers are also getting smarter about the shady legal practices of these unscrupulous debt collection agencies, realizing that many of the tens of thousands of lawsuits initiated by the Trust over the past five years were ONLY won because borrowers failed to appear in court, or simply gave up the fight, allowing the Trust to win in court, then start garnishing paychecks, taking cuts of their Social Security benefits, or even simply withdrawing money directly from borrower’s bank accounts. 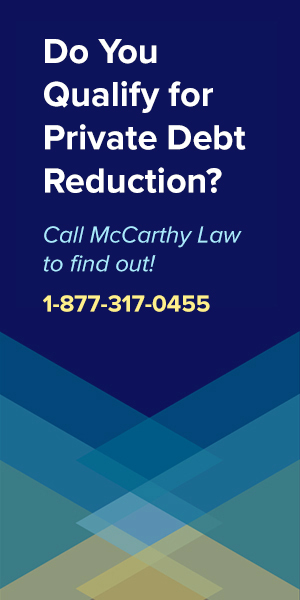 Finally, now that the media is making it more apparent that these lawsuits rest on potentially troubled ground, borrowers are feeling much more comfortable showing up to court, fighting these cases, and even initiating their own legal actions against shady lenders, and winning their own legal battles! The fact is that if your private loan has been resold and is now owned by some massive umbrella organization who had nothing to do with originating it in the first place, then you may have a shot at getting approved for a debt discharge. What you have to do is prove that the lenders didn’t do everything perfectly each time the loan was sold, and that some of the paperwork has been either lost or completed incorrectly. The more times your loan has been sold and transferred hands, the more likely this was to have happened at some point in the hand-overs, and the more likely you are to qualify for a debt discharge. It may sound strange, because you’d think the big banks and investors had learned their lesson, but this situation is eerily similar to what happened with the mortgage industry leading to the 2008 financial crisis. Private student loan debt has been bundled up and sold to investors via the “securitization” process, just like mortgages were in the early 2000’s, and even though there are specific rules for how that process should go down, these massive organizations don’t always comply with the Government’s regulations. Which is good news for you, because it means that if your debt was turned into an investment opportunity that got bought by someone other than the bank who you first got the loan from, there’s a chance the official paper trail was lost, and you may be able to prove that you are no longer legally responsible for paying it back. In fact, each time your debt has been sold, banks, investors and any other groups involved in the process were required to complete some very important paperwork so they could pass specific details through to the next owner, but if any part of that process was forgotten, then it opens up the possibility for you to challenge the validity of your loans, and qualify for a discharge. It may take a while for the massive National College Student Loan Trust case to be resolved (especially since it’s been going on for over a year already), but you should take this as a sign that things may be getting better for private student loan borrowers, and you should be pouncing on this opportunity to challenge the legal validity of your loans, because this is a once-in-a-lifetime opportunity to get rid of your debt without having to pay for any of it.